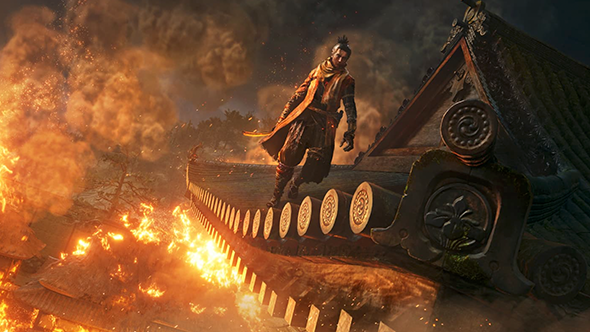 One of FromSoftware boss Hidetaka Miyazaki’s core goals when designing Sekiro: Shadows Die Twice was ‘killing cleverly’. Players will be able to take different approaches to confronting enemies, and overcoming some of them will be tests more of your cleverness than your skill or reactions. For example, you might use the new grappling hook to explore vertical spaces in a level (another one of Miyazaki’s core aims), and thereby find a new vantage point from which to begin a fight. Levels are designed to let you observe and think about how to tackle your opponents, and in some cases you’ll be able to eavesdrop on them outside of combat. As soon as all this E3 madness is over we’re adding Sekiro to our list of exciting upcoming PC games, because it is all of those things. Preparing your prosthetic arm is another aspect of ‘killing cleverly’. Based on your observations, you might equip several gadgets and then “choose on-site to use them.” This all comes from a Famitsu interview with Miyazaki (via Esuteru) so some precision has probably become lost in translation (via Reddit). But as everyone suspected, this makes it sound like several of the prosthetic’s gadgets can be equipped in one of the D-pad’s buttons, like a Dark Souls shield or a Bloodborne trick weapon. We’ve also heard that you can revive yourself in the spot where you died, and that enemies will lose aggro after they’ve killed you, enabling you to die and revive strategically. Apparently, one resurrection is free (shadows die twice, after all) while further resurrections will have a cost of some kind.